I love when you get up in the morning and the birds are singing. It inspired me to make this page. I started with a strip of leftover green plaid paper and this strip of leaf paper. You can't tell the leaves are flocked but they are. I attached these to a sheet of watercolor paper. And then I rubbed some green paint on the final right hand third of the page- as well as the scallops I cut on my background watercolor paper. I then painted the branches and glued on the die cut birds. I recently got a cool die from Hero Arts that cuts out 12 little birds in various positions, so it gave me lots to play with on this page. Then I added a tad of silver tape, some small paper flowers from my stash, and I stamped the final image. I am linking up to the new challenge this month at Art Journal Journey hosted by Rosie. The challenge is Spring. I am also linking up to Moo Mania where the challenge right now is Welcome Spring. So hopefully the weather in my world will last but since it is only March first, I am sure old man winter will rear his ugly head at least once more. Probably once all our snow is totally gone and then we will get a huge dumping. The saying is that March comes in like a lion and out like a lamb, but it is certainly starting here like a lamb. A wonderful page with fantastic colours, Erika. 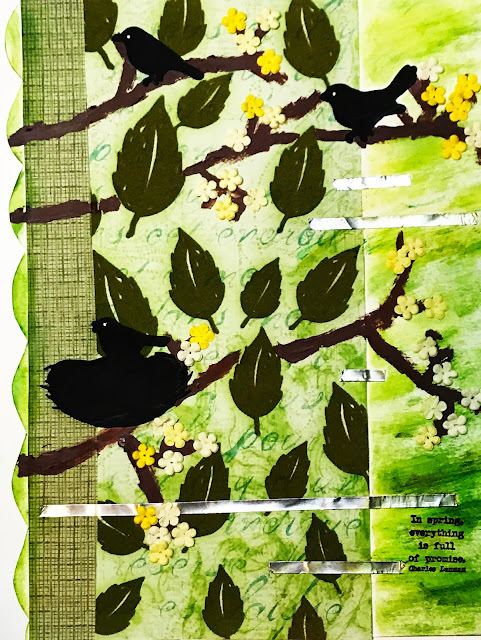 What a wonderful and fresh page with such a lovely quote - all the combining of the die cut parts and hand painting is super and I really like these blooms and the flocked leaves- a wonderful page Erika! This bird die is great - I can imagine you can it use in many ways- I love that we can use the die-cuts also as stencils for spraying or such things!But I am always too lazy to take out all I need for making die cut parts.I have all together in a box and the box doesn't come out automatically, what a pitty! I would wish for the same nice weather for our lovely birds here - I have to put many nuts and seeds out just now - three to four times a day, they are so hungry and need so much fat. Oh well - you really deserve that nice weather - and maybe you are a nice girl friend and send some of it in my direction as well-- they said it would get better and warmer from today on - but - minus 10 degrees Celsius again and lovely snowfall in addition. I started a house spring cleaning - maybe this brings me spring - at least I hope so! Thank you dear Erika for linking so quick to the new theme! You are a sweetheart and a wonderul inspirational artist ! What a fabulous first entry for spring at Art Journal Journey. Buying that die was really smart, and I know you will get lots of use out of it. This page is a beauty. I adore the greens, and like the flocked leaves, even though you are right, I couldn't tell they were flocked. Regardless, I simply adore this page you created for us at Art Journal Journey, dear Erika. SO glad to read your springtime coincided with spring break. I love all the spring green freshness of this page Erika. The birds look so sweet. It is a lovely quote you added as well. I hope your better weather lasts for a while especially as you are on a break from school. Your page is giving me Spring fever. Love it and all the bird silhouettes. I'm guessing you're not getting the Nor'easter predicted for Fri and Sat. Enjoy the rest of your break. Really lovely and bright and happy with thoughts of Spring. We had a wonderfully warm day yesterday too (in Ontario) and it was a happy reminder that spring is soon arriving. Then today, it all went back to snow. Ah well. As you said, it's only just March. Thanks for the artful reminder of spring though! This is a fantastic spring page with that wonderful green, spots of yellow and adorable details! I too love when the birds are singing in the morning, BUT we have to wait - it is snowing now and very cold outside. So good that you have warm sunshine at your break this week! Our weather like yours ended yesterday with snow but not as much as predicted and a warm-up due. Weird year. But I'm glad you have a great weather week so far. Always goo on break! This is a beautiful page -- it would frame well. Just looked out, and it's snowing again! So your page is a beautiful alternative! A lovely cheerful Spring page for AJJ. Love all those greens.